Ryan Scott placed youngsters at a Fife nursery 'at risk of physical and emotional harm'. A nursery worker has been rapped for placing children "at risk of physical and emotional harm" during an angry outburst. Ryan Scott used his knees to force a child to sit down. He also grabbed another youngster by the wrist and forcibly snatched a toy from them. Scott was also reprimanded for stating "they are stressing me out" or words to that affect in front of the two children. The Scottish Social Services Council (SSSC) claimed Scott's actions could have caused the youngsters distress and found that his fitness to practise had been impaired. The incidents took place on or around November 29, 2017 whilst Scott was employed as an early years' practitioner at a nursery in Fife. 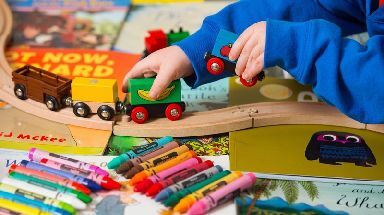 In a report published last month, the SSSC panel stated: "Grabbing a child by the wrist, removing a toy from a child with force and forcing a child to sit down using your knees is behaviour which did or was likely to place young children at risk of harm. "Saying in front of the children that they were stressing you out may have caused the children to feel distressed in a place where they should feel safe and secure and protected from harm. "Your actions demonstrated a loss of self control and a display of aggressive behaviour. Your actions also showed a willingness to use force to get children to comply with your requests. "The behaviour caused or was likely to cause emotional and psychological harm to the children." The panel highlighted that Scott had a previously unblemished record and continued to work for the same service until June 2018 without any other issues. The behaviour was described as an "isolated incident". Scott admitted that his fitness to practise was impaired and accepted a warning on his registration for a period of six months, starting November 23. He must also undertake training in child protection and managing challenging behaviour, as well as submit a reflective account to the SSSC of what he has learned from his misconduct. Following the publication of the SSSC report, a director from the Fife nursery told STV News: "The nursery prioritises the health and wellbeing of the children in our care. "We operate alongside SSSC to ensure that codes of conduct are adhered to. In this instance, our disciplinary process and referral process to SSSC was followed. "As an organisation, we value the development and progression of our workforce. Ryan Scott was placed on a pathway of learning and development under supervision after this incident. "Our outcome concurred with SSSC's independent outcome."